This is the portable edition of Subtitle Edit. As the name implies, the app allows you to make modifications to your subtitle files. It supports a long list of formats for the input, such as SRT, XML, TXT, SUB and RTF. Subtitle Edit Portable is an editor for movie subtitles. With Subtitle Edit you can easily adjust the start time of any subtitle if it is not synchronized with the movie. The features are it converts between SubRib, MicroDVD, Substation Alpha, SAMI, and youtube sbv, cool audio visualizer control - can display wave form and/or spectrogram, import and OCR VobSub sub or idx binary subtitles, and can open subtitles embedded inside mp4 or mv4 files. Since installation is not required, you can store Subtitle Edit on a USB flash drive or any other removable device, save it to any computer and directly run its executable file. What's more important is that the Windows Registry does not receive new entries, and no leftover files can be found on the hard drive after program removal. Plus, you can carry Advanced Driver Updater with you whenever you're on the move. The interface of the program is clean and pretty intuitive. Files can be loaded into the working environment via the file browser or "drag and drop" function. So, you can edit the start and end time, duration and each line of the subtitle, append another subtitle, copy a selected item as text to the Clipboard, split or merge lines, as well as apply a typewriter or karaoke effect, among others. It is also possible to adjust all times, synchronize the subtitles to the corresponding movies while previewing clips in a built-in media player, let Subtitle Edit automatically fix common errors in the selected lines, translate text via Google Translate, as well as use the undo, redo and search functions. Subtitle Edit also offers supports for backing up and restoring data, and displays general subtitle statistics. It uses a moderate-to-high amount of CPU and system memory, has a good response time. 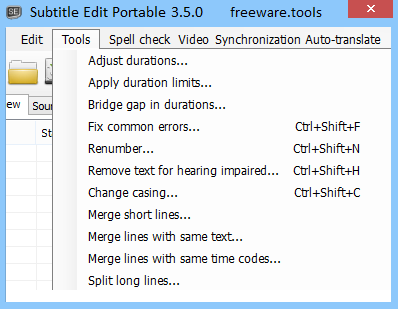 All in all, Subtitle Edit is a feature-packed program for all users who want to seamlessly make subtitle adjustments.